It is always a pleasure to find a new mystery series to introduce to our readers. Canadian writer Scott Thornley has three titles new to the the U.S. audience, and they are terrific. The first, Erasing Memory, finds Detective Superintendent MacNeice enmeshed in the murder of a violinist that stretches back to old Balkan hatreds. The Ambitious City and Raw Bone are equally as fine. MacNeice's team is interesting and well-developed, as is MacNeice himself, who is a widower and has a penchant for watching birds and drinking grappa. A thoughtful, quiet man, he reminds me a bit of Adam Dalgliesh. We have all three titles, so come on in! Detective Superintendent MacNeice is returning from a pilgrimage to his wife's grave when he's called to a crime scene of singular and disturbing beauty. A young woman in evening dress lies gracefully posed on the floor of a pristine summer cottage so that the finger of one hand regularly interrupts the needle arm of a phonograph playing Schubert's Piano Trio. The only visible mark on her is the bruise under her chin, which MacNeice recognizes: it is the mark that distinguishes dedicated violinists, the same mark that once graced his wife. The murder is both ingenious and horrific, and soon entangles MacNeice and his team in Eastern Europe's ancient grievances. 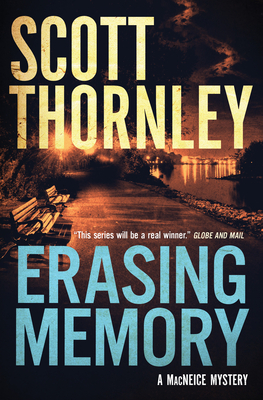 Erasing Memory is a thrilling and assured debut that kicks off an exciting new crime series from Scott Thornley.